The National Health Service Corps (NHSC) released the 2019 Application and Program Guidance for the NHSC Scholarship Program. The scholarship program provides scholarships to health profession students pursuing careers as primary care providers in exchange for their commitment to serve in high-need, underserved communities. The scholarship includes tax-free payment of tuition, required fees, other reasonable educational costs, and a taxable monthly living stipend. Applications close Thursday, May 16, 6:30 p.m. Learn more about eligibility and the process. KAFP active, life and resident members are invited to participate in 2019 Director and Officer Elections. Elections for District Directors (1, 3, 5, 7) and Faculty Directors are conducted by U.S. Mail ballot; while voting for Secretary, Delegate and Alternate Delegate will be conducted in person during the Member Meeting & Election held on Friday, June 7. View all candidates running for KAFP Board of Directors and read their candidate statements on the KAFP website at www.kafponline.org/boardcandidates. Keep an eye out for your ballot to arrive in the mail to vote for District and Faculty director, and make plans to attend the KAFP Member Meeting June 7 for in-person voting for Secretary, Delegate, and Alternate Delegate. KAFP thanks all candidates for running. Thank you to all who completed the Relative Value Scale Update Committee (RUC) survey at the request of American Academy of Family Physicians (AAFP) and the Kansas Academy of Family Physicians – you rock! The RUC survey closed on March 18. The AAFP reports that 360 AAFP members completed the entire survey and 208 AAFP members completed the physician work component. Thank you! According to AAFP CEO Doug Henley, MD, these numbers are excellent. The AAFP far surpassed other medical societies in numbers of survey completions. AAFP staff will attend the RUC meeting later this month and hopes to have data ready from the survey that indicates new Relative Value Units (RVUs). From January 1 to March 28, 2019, 387** individual cases of measles have been confirmed in 15 states. This is the second-greatest number of cases reported in the U.S. since measles was eliminated in 2000. View cases and outbreaks. Routine childhood immunization for MMR vaccine starting with the first dose at 12 through 15 months of age, and the second dose at 4 through 6 years of age or at least 28 days following the first dose. Students at post-high school educational institutions without evidence of measles immunity need two doses of MMR vaccine, with the second dose administered no earlier than 28 days after the first dose. Adults: People who are born during or after 1957 who do not have evidence of immunity against measles should get at least one dose of MMR vaccine. April 4 is Patient Engagement Day! A highlight of the day will be a webinar scheduled for 1:00 p.m. hosted by the University of California San Francisco’s (UCSF) Center for Excellence in Primary Care and moderated by Anjana Sharma, MD. She will feature certain aspects of her group’s research and will highlight case study findings — those bright spots that were central to the team’s nationwide project as part of Family Medicine for America’s Health. Register today for that free webinar, and while you’re at the center for excellence site, be inspired by a video in which physicians and others discuss first-hand experiences in engaging patients to improve care. The Ohio Academy of Family Physicians Joy of Medicine Workgroup is proud to offer all AAFP members access to its 2019 “Wellness Wednesdays” series. And, they are available for FREE as a member benefit, thanks to a grant provided by the AAFP Foundation Family Medicine Philanthropic Consortium (FMPC). The FMPC Dues Check-Off program supports this important initiative. Wellness Wednesdays is a structured, bi-monthly webinar series focused on enhancing professional and personal wellness through the joy of medicine. Sessions are scheduled on a Wednesday, 11:15 a.m. – noon. Download the Wellness Wednesdays flyer that includes the 2019 schedule. Family Medicine Preceptors, Come on Down! KU School of Medicine is seeking excellent family doctors to serve as volunteer faculty to third-year family medicine clerkship students from the Kansas City campus. Students rotate in a 2-week block. Did you know that medical students highly value mentorship from practicing physicians? Did you know that clerkship students rate having a one-on-one teaching relationship with a family doctor as their most desired and most valued experience over the clerkship? Serving as volunteer faculty has perks! Your peers enjoy serving as volunteer faculty! They say that students energize them and that the students teach them almost as much as they teach the students. Patients enjoy students! They report that having a student in the office enhances their experience. You can claim up to 20 CME hours per year for teaching medical students. CMS allows you to attest student notes in lieu of writing duplicate notes of your own! KU will provide you with access to resources, including UpToDate and databases at KUMC Dykes’ Library. Interested? 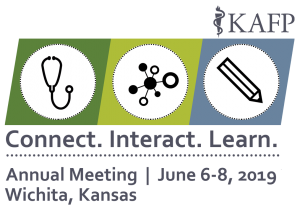 Contact Kristen Estrada, program manager for the Undergraduate Medical Education Division, Family Medicine Department, KU School of Medicine at KESTRADA@kumc.edu. https://kafponline.org/wp-content/uploads/2018/01/KSSPTG_web_large.png 0 0 Marina https://kafponline.org/wp-content/uploads/2018/01/KSSPTG_web_large.png Marina2019-04-01 14:37:332019-04-01 19:59:50Family Medicine Preceptors, Come on Down! This is your last chance to register for the RISE webinar this Wednesday, March 27! 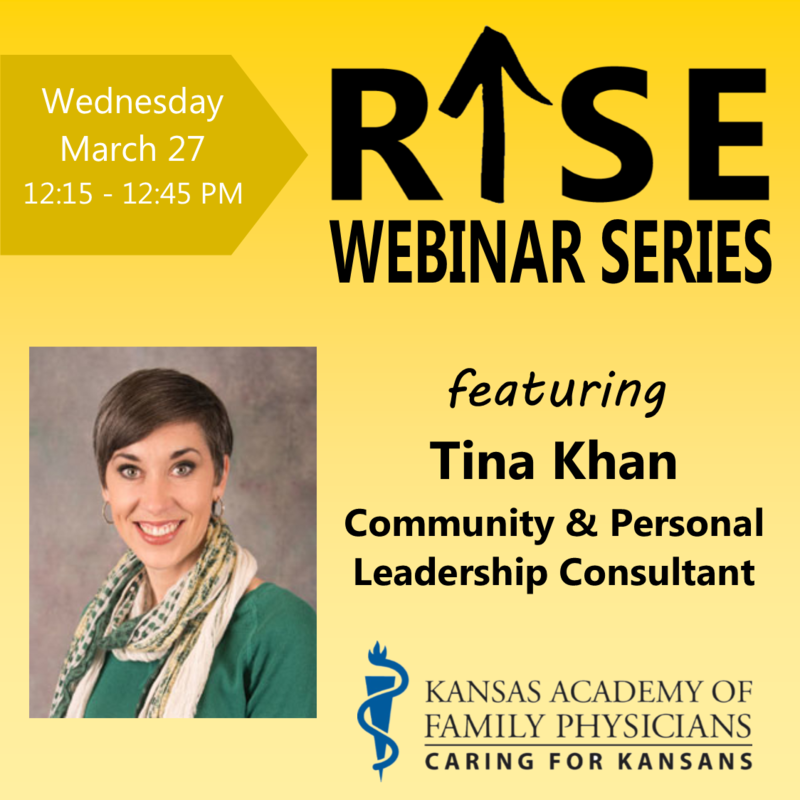 Join us for 30 minutes of learning about wellness through personal leadership development with Tina Khan, Community and Personal Leadership Consultant with Kansas Alliance for Wellness. There is no charge for the RISE Webinar Series. However, registration is required to receive the log-in information for the webinar. RISE: Restore, Invigorate, Strengthen, Energize. The 2019 KAFP Annual Meeting “Connect. Interact. Learn.” online registration is now open! The Annual Meeting Schedule is packed full of quality CME with a variety of topics such as social determinants of health, wound care, smart technology with children, long acting reversible contraception, POCUS, prostate cancer and more! Up to 20.50 CME credits are available! For more information go to 2019 Annual Meeting and view information for attendees, speakers, and/or supporters/exhibitors. You will receive a brochure soon!